The Lumenis LightSheer laser machine is one of the most widely used systems in the world for laser hair removal, and that didn’t happen by accident. This system features the exclusive ChillTip handpiece for exceptional patient comfort and safety, and its 800 nm AIGaAs diode array laser produces results on virtually any skin type or skin tone. SunrayLaser.com has the lowest prices on all three configurations of the Lumenis LightSheer laser machine – the LightSheer ST, LightSheer ET and LightSheer XC. In addition to being effective and widely used, this model is affordable on almost any budget. At SunrayLaser.com, we have quality used Lumenis LightSheer laser machines for sale at up to 60% or more off the price you would pay for a brand new model. Plus, we back up our equipment with a 100% satisfaction guarantee. 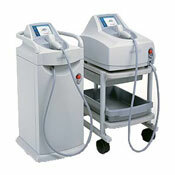 If you want a state-of-the-art laser hair removal system without paying a state-of-the-art price, then contact SunrayLaser.com for a fast and free price quote on a pre-owned Lumenis LightSheer laser system. Whether you are just comparing cosmetic laser machine prices or are looking to buy a system today, we are happy to assist you with whatever information you need. If you have any questions about this model or would like pricing information on used Lumenis LightSheer laser equipment, simply fill out the contact form below.